Impact Night is our weekly prayer gathering. We meet up to pray for our nation, our government, our community and our town. We pray for all the regular activities that take place in our Church building during the week. We ask God to give us vision and wisdom in all things. We are a group committed to praying for revival and to see the Holy Spirit welcome in the Church. Please join with us for nights of impact. Pray 4 You is our community prayer ministry which anyone can access. You can either fill out one of our prayer cards, call us, Facebook us, or email us with anything that you are struggling with and we will Pray4you. All prayer requests are treated with the absolute confidence and we are here to help. Our Pray4you prayer coordinator is Heather Butler so if you need help, get in touch. 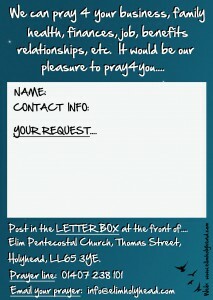 Our prayer cards look this this one below. 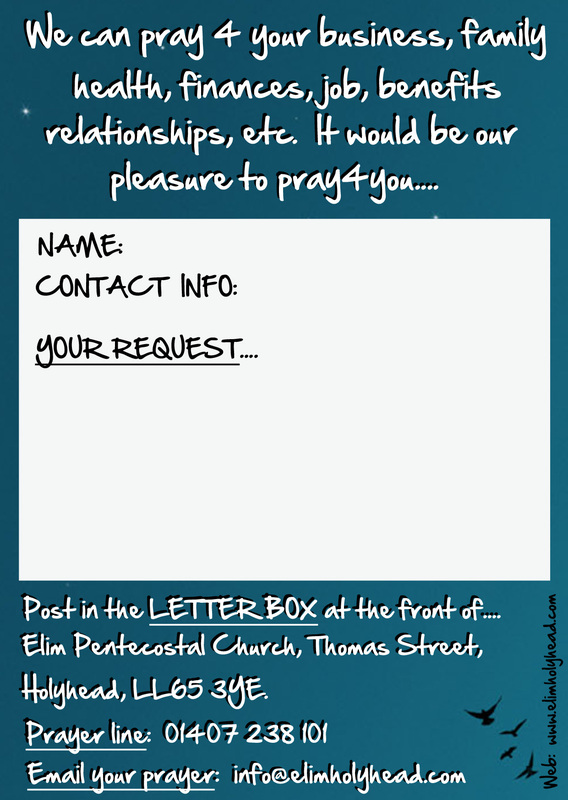 Get one from our foyer, fill out your request and return it to us and we’ll get praying. ELIM CHURCH HOLYHEAD, Thomas Street, Holyhead, LL65 1RR.